Get your FREE EAS Guide today! Yes, please notify me when new products are launched. Selecting the right EML is critical to the overall quality of any EAS and can deliver efficiency, built-in intelligence, and security to your application. The human touchpoint of the system. 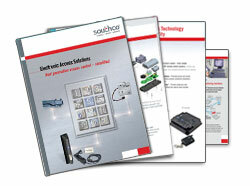 From a simple keypad to a wireless device, the access control can scale to meet your needs. Tying it all together. Remote monitoring options vary from a simple indicator light to a sophisticated system that provides a complete audit trail of user access. Whether you are designing a simple or complex system, our EAS Guide will get you started. © Southco. All Rights Reserved.